Kindergarten is the beginning of an exciting learning journey for children and their families. We welcome our youngest learners by offering a safe, supportive and stimulating environment in the Kindergarten classrooms. It is a time of discovery, growth and wonder. At The Sterling Hall School we offer a robust two-year Kindergarten program where boys have the opportunity to gain the foundational skills to be successful learners. It is our goal to foster independence, self-help skills, confidence and a love for learning. The program follows a rigorous curriculum to ensure that students are well prepared for entry into Grade 1 while also providing opportunities for learning though play-based exploration and inquiry. 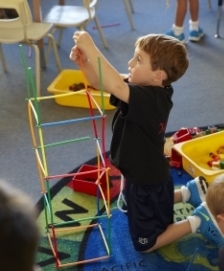 We use a balance of child- and adult-initiated activities that are developmentally meaningful. Students engage in activities that are hands-on and that offer opportunities for differentiated learning. We value innovative academic practices and boy-focused programming that inspire individual growth, curiosity and passion for learning. Click here to read a Letter from our Principal on Sterling Learning.